Paul Ferrante is the author of the T. J. Jackson Mysteries, a series of young adult novels revolving around the paranormal investigations of three teens, T. J., his best friend Bortnicker, and LouAnne, T. J. 's adopted cousin. Each novel in the series tackles events of historical significance—thus the series’ catchphrase, “learn the history to solve the mystery”—and features intriguing plot twists, kind but fully human characters, and a touch of romance. So far, T. J., Bortnicker, and LouAnne have battled a Confederate soldier’s ghost at Gettysburg ("Last Ghost at Gettysburg"), untangled a mystery involving a legendary Bermudian buccaneer’s ghost ("Spirits of the Pirate House"), and investigated the appearance of the ghost of Roberto Clemente in Cooperstown ("Roberto's Return"). Ferrante’s fourth novel in the series, “Curse of the Fairfield Witch,” was released in May and takes place much closer to home. Fairfield is where both the author and two of his protagonists (T. J. and Bortnicker) live. Ferrante will mark the release of his fourth novel with a book launch reception and author talk on Sunday, June 28 from 2 – 4 p.m. at Avellino's Italian Restaurant (1813 Post Road in Fairfield). Copies of “Curse of the Fairfield Witch,” as well as the first three books in the series, will be available for purchase. Complimentary hors d'oeuvres and wine will be served. 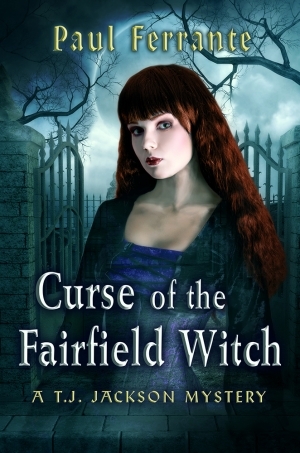 Congratulations on your fourth novel, “Curse of the Fairfield Witch”! Your trio of ghost hunters has traveled to Pennsylvania, Bermuda, and New York. What inspired you to set your latest so close to home? Originally, my daughter Caroline suggested I feature a female ghost for the book, with Salem, MA as the setting. I was a little leery about this because Salem has been so overdone, and because I have only been there once myself (I like to be totally familiar with the surroundings of my novel settings). So, I decided to look into Witchcraft Trials in my immediate area, and boy, was I glad I did. I soon realized I had to look no farther than my own backyard for a wealth of Witchcraft Trial history. And, because I've lived here for almost 20 years, I could give the book a real local flavor and promote our town. From the beginning, T.J. Jackson and his sidekick Bortnicker were listed as residents of Fairfield, so the setting just fell into place. Please tell us about the research process. How and where did you conduct it? I began with some preliminary research online of Witchcraft Trials in Connecticut. Then, I visited the Fairfield Museum and History Center, where their very helpful staff set me up with a wealth of materials. From there it was on to the Fairfield Public Library. I'd say that overall the research phase took a couple months, with a lot of gathering and reading. I then started crafting the story around the actual history, with a focus on the year 1662. For all four of the books in the T.J. Jackson Mysteriesseries, my goal has been to teach as well as entertain. My readers will learn much about the Witchcraft hysteria of the 1600s as it manifested in this area, as well as paranormal sensitives and mediums, modern witchcraft (Wicca), and even Voodoo. We New Englanders do tend to love our colonial history. What about this time period appealed to you as a setting for the novel? The 1600s was the beginning for our area, as far as Colonial settlement, anyway. I think it's fascinating how our towns grew outward from crude villages that hugged the Long Island Sound coast. Danger lurked around every corner, and religious fervor was seen as a means of protection from this harsh environment. Unfortunately, with this zealotry came the belief that Satan was among us always, and that witches were his followers. It was a kind of paranoia that sometimes got way out of hand, and there's a lesson to be learned here about acceptance and tolerance for those whom we might view as "different." Finally, since the last young adult novel on this subject, “The Witch of Blackbird Pond,” was published over 50 years ago, I felt it was time for a more modern take on the era. Just one look at the book's cover should get this across. Without giving too much away, what are some landmarks local readers will recognize in the story? This was the fun part of writing the book. Since the kids had to have access by bicycle to Fairfield's Historic District (they're not quite old enough to drive yet), I placed the boys' actual residence at Tide Mill Terrace, near Sasco Beach Park. That way, T.J., Bortnicker, and LouAnne (who comes up from Gettysburg) could roam all around the area. In the course of the book they manage to visit all of the town beaches, a number of restaurants (Flipside, Pizza Palace, Archie Moore's, Avellino's, Dairy Queen), First Church Congregational (called First Community in the book), Town Hall, the Village Green, the Fairfield Museum, and the Old Burial Ground on Beach Road. Most of the paranormal action takes place in that small area around the Village Green, which was the hub of the original settlement. You could put together quite a historic venue/restaurant crawl from the places the kids visit in the story! How has your understanding of the characters evolved over the four books? Has there been anything that has surprised you about the characters, how they’ve developed, and the relationships among the three of them? When the series started, the boys were just graduating from middle school. Louanne, who is their age, is a year ahead in school. As this book begins, the boys are finishing sophomore year in high school, LouAnne her junior year. Through their experiences in the first three books - including the fame which has come from their ghosthunting reality TV series - they have all grown, and I've come to think of them as real people. But they're not perfect, by any means. T.J. is the leader, but he is still given to occasional feelings of self-doubt, coupled with the growing acceptance of his paranormal "sensitivity" and his discomfort with the limelight. Bortnicker is still lovably quirky, but has developed more self-awareness and confidence as he tries to distance himself from his "middle school nerd" past. And LouAnne, the seemingly perfect "All-American Girl," has gone through some pretty tough times in the recent books, but is still sassy and strong. As far as relationships, the boys, despite their occasional spats, are tighter than ever, and the romantic relationship between T.J. and his adopted cousin continues to progress, albeit cautiously, as they keep tying to figure it all out. ‘Curse of the Fairfield Witch’ also goes deeper into the family relationships of the boys. Bortnicker's grandparents, who were introduced in book three (“Roberto's Return”) have an important role, and single parents Tom Jackson Sr. and Pippa Bortnicker contribute more than cameo appearances. Bortnicker's long-lost father also figures into the plot, but I can't give it away. What’s next for the characters? Is there a 5th book in the works, and if so, where will their next adventure take them? Originally, I saw the series as a trilogy. But then my daughter persuaded me to write this one, and I'm glad I did. As far as a fifth installment, I would like them to have another adventure before they're off to college, and I'm knocking around a few ideas. But what I won't do is continue the series just to throw more product out there. I know I personally get disappointed when a writer I like prolongs a series and the books start sounding the same. So if there is a number 5, it will be different, that's for sure. Stay tuned!